A beautiful stained glass window with a dove and olive branch greets patients, caregivers and staff when they walk into the newly renovated Purdom Chapel on Winship Cancer Institute's first floor. The remodeled chapel, which was dedicated in a ceremony on March 14, provides seating for more than a dozen people. 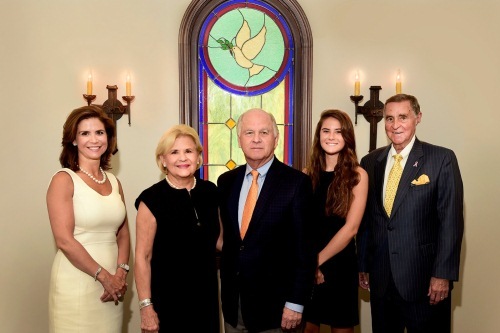 The chapel renovation was supported by the Brenda Nease Fund at Winship in memory of Brenda and Mac Nease’s son, Lawton MacDonald Nease IV who passed away from cancer in 1994. Brenda is a long time member of the Winship Advisory Board. Winship's Executive Director Walter J. Curran, Jr., MD presided over the dedication ceremony saying "the chapel is a peaceful place in the midst of a busy cancer center where people can take time to reflect, meditate and pray." Other remarks were delivered by the Rev. Donald A. Harp, Jr., DMin, pastor emeritus at Peachtree Road United Methodist Church, pastor/theologian-in-residence at the Candler School of Theology and member of the Winship Advisory Board, and George H. Grant, PhD, executive director of Spiritual Health for Emory Healthcare. The Purdom Chapel was established at Winship by Dr. E. Stephen Purdom in memory of his parents Ernest and Tommie Ruth Purdom. Pictured: Shannon Nease, Brenda Nease, Mac Nease, Brenda and Mac's granddaughter Lawton and Rev. Harp, Jr. Learn more about pastoral services at Winship.